Product prices and availability are accurate as of 2019-04-08 02:40:50 EDT and are subject to change. Any price and availability information displayed on http://www.amazon.com/ at the time of purchase will apply to the purchase of this product. 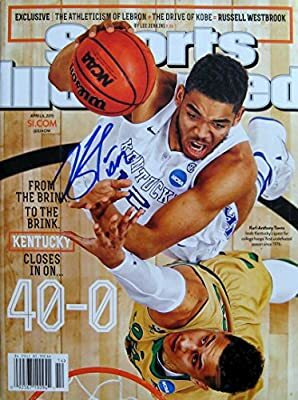 Kentucky Wildcats star freshman Karl Anthony Towns autographed mint NO LABEL regional Sports Illustrated magazine : 100% GUARANTEE: SI KINGS started collecting IN PERSON autographs in 1982 and since that time we've become the largest Autographed Sports Illustrated dealer in the world. Quality and Authenticity allows me to say we are the leading authority on Signed Sports Illustrated magazines. SI KINGS witnesses all signatures and stands behind every item with a 100% guarantee. OUR COA: An SI KINGS Certificate of Authenticity is issued for each purchased collectible. Each Certificate will have the corresponding name of the signature and date of the magazine / item purchased.